Create a Factory Look with a Factory Edge!!! The Hira-To® is a single head flat hone with a patented fixture and arm assembly. The fixture sharpens both right hand and left hand shears and allows you to set a precise angle making sharpening a breeze. 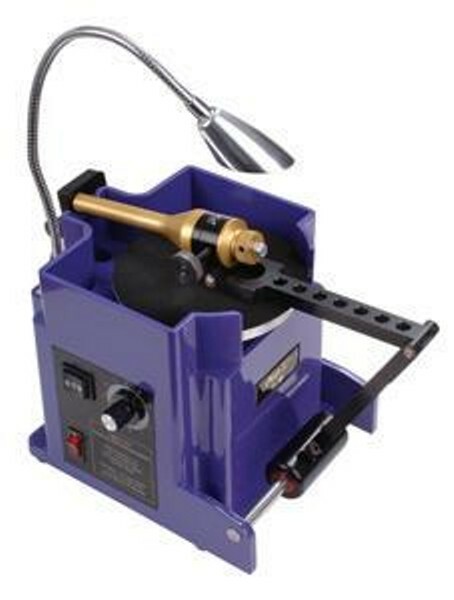 The sliding arm allows the sharpener to convex the entire front surface of the shear. Because of this the sharpener will not miss the back side of the spine. The machine has variable speed, forward and reverse controls, and a quick change head.